We’re having a USB mad day today. 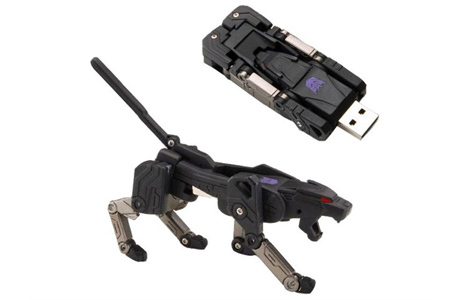 Hot on the heals of the Transformers USB hub that looks like Blaster and transforms into a laptop comes this 2GB USB memory stick that Transformers into Ravage, the master of stealth. The USB stick mode looks just like a micro cassette tape, and then he transforms into the classic Ravage panther mode. We’re not sure if Ravage will actually fit into the chest of the USB hub Blaster though… now there’s a thought. 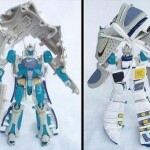 Ravage retails for around $43 and you can pre-order one from Big Bad Toy Store now. 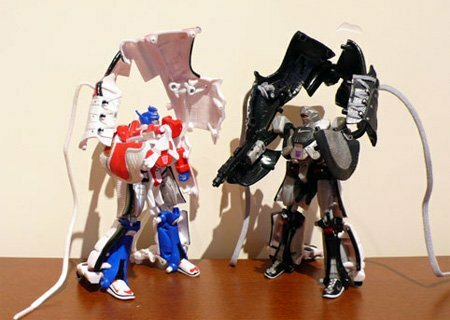 Soundwave may be featuring in the new Transformers movie, Transformers Revenge of the Fallen, but Blaster was always the coolest of the cassette wielding robots. 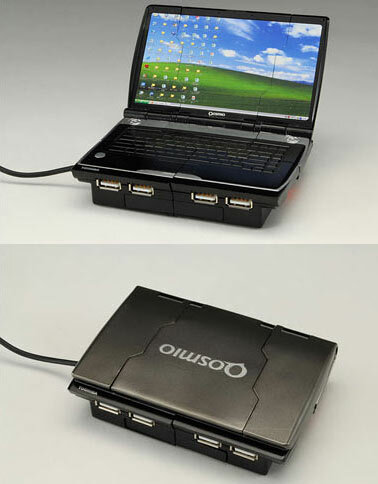 Now you can own your very own Blaster in laptop form, and he has a practical use too. 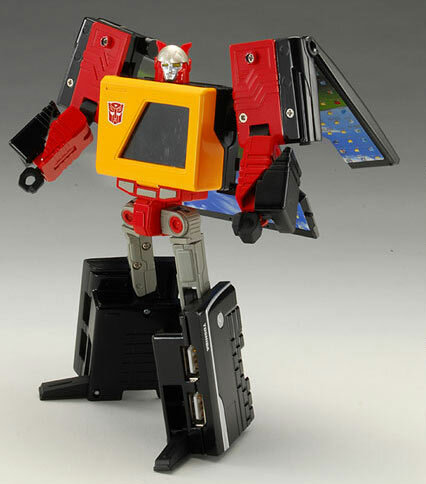 This Transformers USB hub transforms from a laptop (complete with a Windows XP screen) to a robot (with a tape deck) and the whole while he acts as a 4 way USB hub. Who could want for anything more? Well, maybe if the laptop actually worked as well, but it doesn’t, sadly. 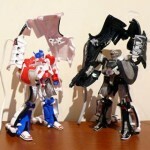 The Transformers USB hub is from CraziestGadgets and is set to retail for around $42 in the USA. You can pre-order the Transformers USB hub from BBTS here. 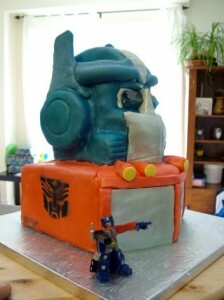 We just received an email with a link to this Optimus Prime birthday cake that someone made for their three year old son. This was especially interesting to me as I’ve always wanted an Optimus Prime birthday cake, and have been dropping the most subtle of hints for the last few years, to no avail. Maybe I could approach whoever made this cake and see if they’ll do it for a fee? Ever wanted to drive your own Transformer? Of course you have, and now thanks to Chevrolet you can. 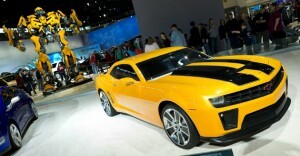 To commemorate the release of the new Transformers movie: Transformers Revenge of the Fallen, Chevy are releasing an exclusive Bumblebee branded version of their Camaro, as seen in the Transformers movies. The Camaro comes in yellow colours with the black racing stripes, just like the real Bumblebee. That’s not all though, the car also features the Autobot insignia on the steering wheel, the seats and the wheel centres. You can place your order why Chevy for your own Bumblebee in June until December this year, and be the envy of all of your friends. As for the technical specs of the car, it’s available in V6 or V8 and in the LT and SS trims. You can have the RS package as an optional extra which would give you the HID xenon headlights and 20 inch wheels. 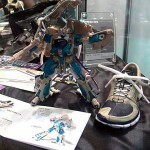 If you like your footwear made from plastic, unusable as shoes and with the uncanny ability to transform into Autobots and Decepticons, then Nike has the footwear for you. 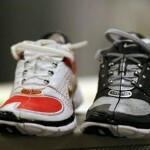 By footwear, we mean something resembles footwear, cos you can’t actually wear it… obviously. 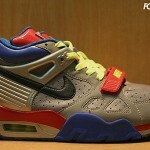 Nike has produced some Nike Air III trainers to publicise the upcoming Transformers sequel, Transformers Revenge of the Fallen. Sadly for footwear fans (if there in fact any such things as footwear fans) the trainers aren’t scheduled for any kind of release. 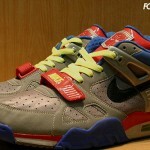 I wonder if you could convince your parents to buy you these as a new pair of trainers? The second poster for Transformers Revenge of the Fallen features the North American release date and the tagline “Revenge is Coming”, with The Fallen’s eyes glowing in the darkness. More HarperCollins books. Official Site.